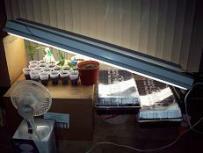 My most successful homemade hydroponics system was the result of many years of trial and error. A good design eliminates many of the potential problems with using a hydroponic system and simplifies its day to day use. In the end success depends not only on a good hydroponic system design, but also on how you use it (good hydroponic gardening technique). Below I describe my homemade system, along with design changes I've made over time and why. Next I discuss construction tips and a couple small problems that still exist with the system. Finally, I share my experience on proper hydroponic gardening technique to help you get the best results from your homemade hydroponic system. Tools- power drill, 2 3/4 inch hole saw, hack saw or sawsall, soldering iron, tape measure, marker, and chalk line. 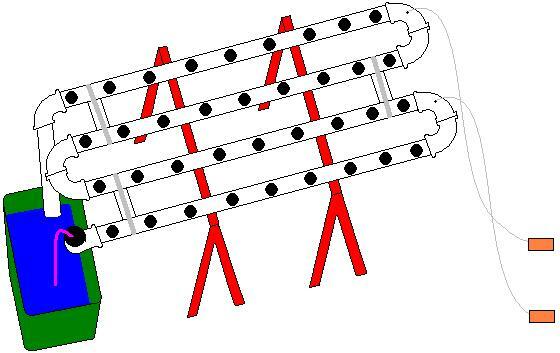 Materials- four 10 FT lengths of 4 inch PVC pipe, eight 4 inch PVC elbows, PVC primer, PVC glue, 30 gallon plastic storage tote with lid, 240-400 gallon per hour hydroponic pump, four feet black hydroponic pump hose, two or three fish aquarium air pumps with 6 inch air stones, forty 16 OZ plastic beverage cups (disposable kind), 20 liter bag of expanded clay pellets, two sawhorses, and duct tape. This homemade hydroponic system is 3 1/2 FT X 8 ft. Fully loaded it can hold 36 plants. Plants are added to the system when they are about 6 inches tall. The system itself holds about 15 gallons of water and the nutrient reservoir holds another 15-20 gallons, for a total of 30-35 gallons of nutrient solution (slightly less than 1 gallon per plant). First, cut the four PVC pipes into 7 FT 6 inch lengths. When cutting PVC it is important to make our cuts nice and straight, otherwise one side of the pipe will be longer than the other (this could cause problems later). With your fingers or a thin piece of metal, scrape off any burred PVC from the cut so you have a nice clean edge. Next, cut three 6 inch pieces making sure the cuts are straight and cleaning the edges. These pieces will be used to make u-turns out of the PVC elbows. When a piece of PVC is glued into a fitting, it needs to be held in place for several seconds (it tends to pop back out). 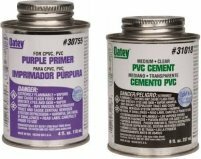 Before gluing PVC, make sure all PVC burrs have been cleaned from the cut pieces. Clean the inside of the fitting AND the end of the pipe with PVC primer. Go around 3 or 4 times on each. Next, apply glue to both the fitting AND to the end of the pipe. Go around 3 or 4 times on each, making sure you haven't missed any spots. The glue should cover 1 1/2 inches on the end of the pipe. Twist the pieces a little as you push them together to smear shut any air bubbles. Immediately after pushing each u-turn together, set it upright on a flat surface (open ends down) to make sure it sits perfectly flat. If not, adjust the piece while the glue is still wet. Make sure to hold the piece in place for several seconds before letting it go. Make 3 u-turns this way. Once the u-turn pieces are sufficiently dry (a few minutes), I recommend gluing together the rest of the system BEFORE cutting the holes for the plants. First, locate a large, flat area upon which to work. The area must be large enough to fit the entire system. Your finished homemade hydroponic system will only be as flat and level as your work area. Glue an elbow to one of the long pipes, following the gluing guidelines above. This will be where water enters the system (see the diagram). Glue the other end of this pipe into one of the u-turns, making sure the elbow is facing up and the u-turn is lying flat on the ground. Into the other end of this u-turn, glue another long pipe. To the other end of this pipe glue another u-turn, making sure it is sitting flat on the ground when finished. Into the other end of this u-turn glue another long piece. On the other end of this pipe glue the final u-turn, making sure it is sitting flat on the ground when finished. Into the other side of this u-turn glue your final long piece. On the other end of this piece push on, but DO NOT GLUE, your final 90* elbow. For now, this elbow should point up in the air and will keep your final long piece level as it dries. I recommend letting your system dry overnight before trying to cut the holes for the plants. It is important to make each hole precisely at the top of the PVC tube- a little off center to either side and THAT will be the spot your homemade hydroponic system is likely to leak. It is helpful to use a chalk line (and a friend) to snap a line down the very top center of each tube, or to mark it with a permanent marker before you begin marking out the plant holes. Then, with a marker or pencil, measure 3 1/2 inches in from the elbow (at either end of a long pipe) and mark it with a dot over the center line. Next, measure every 10 inches along the pipe (starting from the first dot) placing dots for each plant hole. Each long pipe should end up with 9 dots. Drilling a pilot hole into each dot with a small drill bit (i.e. 1/8 inch) will prevent the hole saw bit from "walking". The long pipes of the system make great levers- if moved up or down, left or right too much from their resting position, it can crack the system at the u-turn joint. Measure the distance between your long pipes. Cut three sections of PVC to this length. Wedge these sections in between your long pipes (at opposite ends of the u-joints) and duct tape them in place. Make sure the duct tape runs in between plant holes rather than covering them. This will splint your long pipes into relatively safe positions. Once the homemade hydroponic system has been reinforced to prevent breaking, it's time to clean it well and flush it out a couple of times. Lift the system off of the ground and set it on a couple of sawhorses. Place the reservoir at the end of the system to catch the rinse water. Use a hose with a good spray nozzle to shoot water and PVC burr debris from each pipe. A new toilet brush also comes in handy for this. Start at one end and work your way from hole to hole through the entire system. Rinse several times, making sure you have gotten all of the PVC bits out. Netted pots are made from the 16 OZ cups by burning small (1/4 inch) holes with a soldering iron in the bottoms and sides. Be sure to work in a well ventilated area- plastic smoke is toxic. If this is overly concerning to you, consider purchasing netted pots from your local hydroponic gardening store or from an online distributor. It is important these holes are not visible when you place the cups into your homemade hydroponic system. 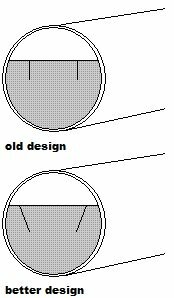 Before making the holes, place the cups into your system to see how deeply they sit. If you need to, mark them with a marker while they sit in the system. Also, the holes should not be large enough to let clay pellets slip through once the cups are filled. When finished, each 2 3/4 inch plant hole will receive one homemade netted pot. The water level within the system needs to be kept as high as possible without causing any leaks. To do this, a dam is constructed at the end of the system just before the water pours back into the reservoir. Simply find a piece of thin plastic, such as a milk jug. Using a scrap piece of 4 inch PVC, trace a circle on the plastic and cut it out. Cut a flat side off of the circle representing the height you would like to keep the water level inside the pipes. Cut two slits into this flat side, giving you a flap you can bend down to fine tune the water level. Now wedge it into place using the last 90* elbow to test things out. This last elbow remains unglued to facilitate water changes in your homemade hydroponic system. Instead of gluing the elbow, simply coat it with a thin layer of Vaseline. Attach a 24-30 inch piece of PVC to this elbow to carry water from the homemade hydroponic system back to the nutrient reservoir. Rather than pointing straight down, this pipe should be made to run at an angle to prevent splashing and the sound of falling water. The end of this pipe should be underwater inside the nutrient reservoir. Cut notches in the side of the reservoir lid to accommodate the water pump line and PVC return. Fill the system with water and fill the reservoir about 1/3 full of water. Turn on the hydroponic pump and wait until there is just as much water returning to the system as there is being pumped into the system. Ideally, the water level should be 1/4 inch or less below the edge of each plant hole. 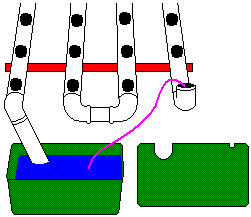 Using the PVC discs (saved from cutting out the plant holes) level the system, raising sections until the water level is the same distance below each plant hole. If the water level needs to come up or down on the entire system, simply adjust the dam. Pre-soak the expanded clay pellets overnight. If they are brand new, soak and rinse them several times before using. 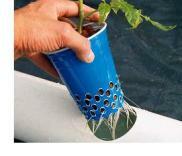 Take the 16 OZ cups (with holes) and place one in each plant hole. Add enough clay pellets to each cup to just make it above the water level in the cup. Jiggle them around with your finger to settle them. The top layer of pellets should be 1/2 in the water and 1/2 out. Take 6 inch clones or seedlings and place one in each cup, adding presoaked clay pellets to each cup as you go to completely cover the roots and any cloning medium (i.e. rubber dirt plug or rockwool). Once plants are in the homemade hydroponic system, it is important to add the air bubblers! Turn the water pump off to add nutrients to the reservoir. Bring the nutrient strength up to the level you have established in your feeding plan. Turn the pump back on (very important). Check the nutrient strength/pH again in an hour as your nutrient solution will become diluted with the plain water from inside the system. In an hour, check and adjust the nutrient solution one final time. Afterward, place the lid on the nutrient reservoir and follow the regular routine for maintaining a nutrient solution. Finally, I hang the lights and fans. 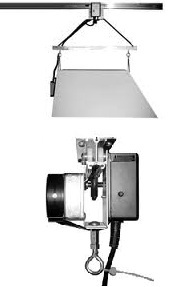 I have found a 1000 watt light on a very short light mover to be perfect for this garden. Along one 8 foot side and the two 4 foot sides I hang reflective material. In the center of the other 8 foot side, I position a 12 inch oscillating fan on a stand (at plant height) and hang a 400 cubic foot per minute centrifugal fan, which I use to push cool air into the garden area. While you could start seeds in this homemade hydroponic system and grow them start to finish, it is much more efficient to start seedlings in a smaller area under regular fluorescent lights and transplant them into this system when you are ready to flower them. By using this garden as a flowering area, you can start another batch of clones or seedlings under your fluorescent lights and have them ready to go in as your last crop finishes up. Once you have 6 inch tall seedlings or clones with roots, put them into the system and grow them vegetatively for one week (just long enough to get situated). If any of these plants die, remove the plant and it's roots but leave the cup and clay pellets in the plant hole. Then, cut the light cycle to 12 hours on/12 hours off using a digital timer and allow them to flower. This homemade hydroponic system is prone to leaks because the water level in the system needs to be kept close to the spilling point in order to give the plants' roots enough area in which to grow. Also, half way through flowering, the volume of the root mass in the system became a small problem. The hydroponic pump placed 360 gallons per hour into the system; however, because of all the roots, the water could no longer flow through the system at 360 GPH... so the water slowly backed up and began to leak out. To solve this, I put a "T" in the water pump line. I left one side in the nutrient reservoir (recirculating the nutrient solution) and fed the other side of the "T" into the homemade hydroponic system. This cut the GPH running through the system to 180 GPH, stopped the leaking, and caused no ill effects to the plants. Because of these issues, I suggest running this homemade hydroponic system on an unfinished basement floor with a drain (or perhaps in a garage with a gravel floor). You could also figure out some way to contain the small leaks, like strategically placing a plastic sheet under the system to funnel leaks back to the reservoir. Better yet, read about my next homemade hydroponic system...a re-design of this system that eliminates the problem with leaks altogether. A lack of drip/spray emitters make this system reliable and easy to maintain. The pump is a low pressure pump, eliminating any risk of catastrophic failure like bursting pipes (which spray everywhere until the reservoir is empty, putting your lights and electrical equipment at risk and posing a fire hazard). A leak in this system is not likely to spray (just drip) and it would be nearly impossible to empty the whole system. This system design minimizes light exposure to the nutrient solution, which prevents algae, which prevents fungus gnats, which prevents root damage. In the event of a power failure, the standing water in this homemade hydroponic system will prevent damage to your roots/plants for quite some time. Finally, it is relatively easy to check, adjust, and change the nutrient solution in this system.